If you are a lover of the aesthetic of vintage photography and Instagram’s filters don’t quite cut it for you, then there are plenty of opportunities even in this post-film age to sample the real thing. Plastic lens cameras from the former Soviet Bloc countries or the Pacific rim are still in production, and you can still buy 35mm and 120 roll film to put in them. You can even still buy 8mm film for your vintage movie camera, but it’s rather pricey. [Claire Wright] is a young film maker who had an old 8mm camera and really wanted that analog film feel to her work, and she and her father solved this problem by using the 8mm camera’s lens in front of a Raspberry Pi camera sensor. Since an 8mm film frame is 4.5mm x 3.3mm and the Pi camera sensor size is 3.76mm x 2.74mm, it’s quite a good fit. Their first prototype had a custom case which concealed the Pi camera behind the lens on rails taken from an old CD-ROM drive, and had an HDMI screen on top and a pistol grip to make it portable. An external thumb screw allowed the camera to be positioned in the focal plane. A further refinement has stepper motor driven focus driven from an Adafruit motor drive HAT. The software is simply the standard Pi camera utilities. To demonstrate the system, she made a short video about how it came to be, and took the camera on a road trip to Austin, Texas. She tells us a local 3D print shop is working on a 3D model to replicate the camera, but sadly as yet there are no resources for the Hackaday crowd to examine. Her video is below. She has certainly captured the feel of an 8mm film very well. If the SUVs were replaced by cars with more chrome in her Mainstreet America, you might almost be there in the 1950s. There’s a certain mystique about old home movies and 8mm film; whether it’s footage from a family gathering from 40 years ago or a stop-motion animation you made when you were 12, there’s an immediacy for film that the VHS tapes from your family’s first camcorder can’t match. [Teslas Moustache] has been getting into 8mm cameras and projectors, so when he came across a 8mm/super 8 projector that needed a bulb, he knew he had a worthwhile project on his hands. To replace the burnt-out and very expensive to replace incandescent bulb, [Teslas] sourced a very bright star LED from Jameco. This 1 Watt LED puts out more than enough light to project a frame of film onto a screen and fortunately doesn’t get as hot as the stock bulb. To power the LED, [Teslas] used a cell phone charger powered from the 120 VAC incandescent socket to supply the requisite 5 Volts at 1 Amp (Ohm’s Law works on coffee) power for the LED. Right now, there’s still the matter of fabricating a nice enclosure to mount the LED and charger in the bulb socket, but once [Teslas] figures that out, he’ll have a very nice 8mm projector on his hands. Many of us have these old 8mm family videos lying around and many of us have lamented at the perspective cost to get them converted to digital. [Paul] came up with a pretty slick way of digitizing them himself. 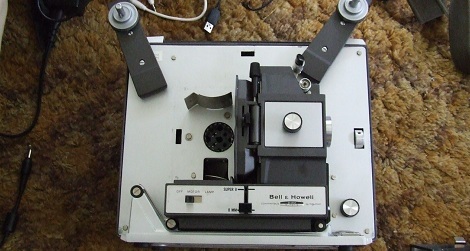 He cracked open an 8mm projector and replaced the drive motor with one he could run at a much slower speed, allowing him to be able to capture each frame individually with his digital camera. He’s rigged his remote shutter control to the shutter of the projector so that it would be perfectly synchronized. There’s a video of it in action on the flickr page, and a video of the full 16,000 frame clip after digitization here.